One day, I saw a patient for a follow up visit and while we shook hands, he said: “How are you doing Dr. Darkfield?” Needless to say, as my STD career developed over the years, I have always cherished my misbegotten name. Darkfield microscopy was introduced in 1830 by Joseph Jackson Lister (the father of the famous surgeon and pioneer of antiseptic surgery, Joseph Lister). Using a condenser to illuminate the specimen from an oblique angle he was able to visualize particles that were invisible in direct microscopy, very similar to how we “see” small dust specks in a ray of sunlight. A brilliant invention – pun very much intended. Karl Landsteiner (he of ABO blood group fame) and Viktor Mucha first described live spirochaetes in dark field preparations from patients with syphilitic ulcerations in 1906. However, a year earlier, it was Fritz Schaudinn who, together with his colleague Erich Hoffmann, is credited for the discovery of Spirochaeta pallida, a.k.a. Treponema pallidumin Giemsa stained preparations. Schaudinn did not enjoy his fame for very long as he died of complicated amebiasis in 1907 at age 34, perhaps due to a self-inflicted infection when studying this disease. But, that’s another story. Meanwhile, darkfield microscopy soon became the gold standard for diagnosing primary, secondary, and congenital syphilis and held on to this distinction to the present day, only to be surpassed by recently developed DNA amplification tests. 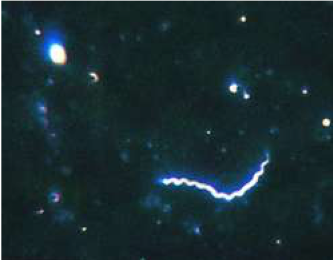 In my early years as an STD doctor when syphilis was very prevalent, I have done hundreds of darkfield examinations, and I have always been awed by the sheer elegance of the method, especially when the specimen was positive for spirochetes and I could share the view with our clinicians so they could come face to face with the perpetrator of the disease they just witnessed in their patient and were about to treat. Unfortunately, over time, darkfield microscopy has become almost obsolete. There are a number of reasons for this. First, with the declining incidence of syphilis in the 1990s, darkfield experience among laboratorians (and physicians) declined. While the technique is actually not very difficult, the test requires a special (dark) environment as well as experience, time, and patience of the laboratorian. Second, spirochetes are very difficult to culture and thus not easily available for laboratorian proficiency testing and quality assurance, something that laboratory credentialing and oversight committees require. As a result, many labs stopped doing these tests – leaving Joseph, Karl and poor young Fritz turning in their graves…. This presents us with a baffling conundrum. According to recently revised case definitions by the CDC, primary and secondary syphilis and also congenital syphilis can only be definitively diagnosed with a positive dark field test or a positive nucleic acid amplification test, the latter available in just a few research laboratories. Yet, bureaucratic restrictions do not allow many of us to perform the darkfield test! With syphilis once again a public health emergency, I think this is an unacceptable state of affairs. I realize that novel technology is available for very sensitive testing. Multiplex PCR testing can detect and distinguish the most important causes of genital ulcer disease, including syphilis, genital herpes, and chancroid. The problem is that there are no economic incentives to the industry to bring these tests to market and point of care testing using these and other technological advances are even farther away. While we should push hard for the advancement of new technology, we should realize that we have a readily available syphilis point of care test that is gathering dust in the broom closet of many labs. We should be able to negotiate with regulatory agencies to re-instate the darkfield microscope, not only as a diagnostic device but also as a training tool to demonstrate the link between etiology and clinical presentation and between history and present; to deepen the understanding and enhance the skills of our clinicians and laboratorians; and to improve the quality of our STI care services.